Strawberry Banana is a 70/30 indica-dominant cannabis strain developed by DNA Genetics in collaboration with Serious Seeds. A genetic cross between two fruity strains, Crockett’s Banana Kush and the “Strawberry” phenotype of the Bubble Gum strain. Strawberry Banana inherits a sweet fruity flavor that earned this indica her name. Known for its aroma, terpene profile and heavy resin production, Strawberry Banana produces happy, peaceful effects that sharpen creativity and sensory awareness. 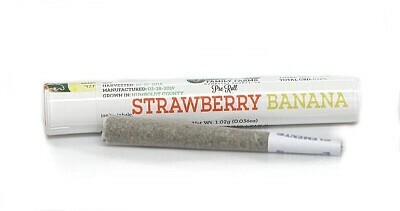 Strawberry Banana delivers a creeper buzz that builds slowly, often taking several minutes after smokers have savored its unique taste before full effects are realized. People report a sharpened sensory perception and may feel as though certain sights or sounds have a psychedelic twist. Before long though, the powerful indica high settles in by inducing a full body and mind relaxation. Enjoy this flavor-packed strain in the evenings after the day’s tasks are done or save it for the weekend. The flavor makes you wanna keep puffing on this sweet treat making it very easy to overindulge.